Local children plant seeds that have been in orbit with UK-astronaut Tim Peake. The children are helping with an extra-terrestrial botanic experiment to see if seeds that have been in space grow differently than those that have never left Earth. 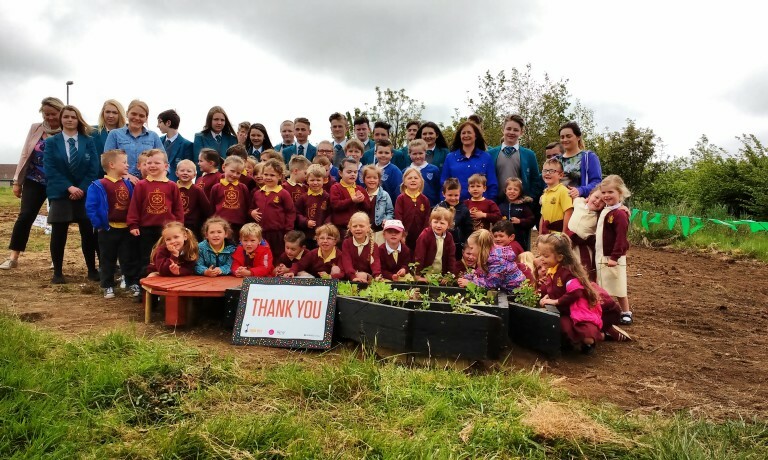 The seeds were provided as part of a UK-wide experiment by the Royal Horticultural Society (RHS) – while the planting itself took place as part of The Cornfield Project. Last September, 2kg of rocket seeds were flown to the International Space Station (ISS) on Soyuz 44S where they spent several months in microgravity before returning to Earth in March, as part of an educational project launched by the RHS Campaign for School Gardening and the UK Space Agency. The children – from Harpur’s Hill PS, Ballysally PS and Millburn PS – were given two batches of seeds, in red or blue packets, measured the rocket’s growth over seven weeks, and will not be told which is the control group until the results have been collected. North Coast Integrated College were a huge support to the project by designing and building a new rocket shaped planter for the three local primary schools to plant their rocket and to use for future class activities, teaching the children how to grow their own fruit and vegetables. Strawberries and several batches of wild flowers were also planted at the Rocket Festival, which marks the start of sowing season at The Cornfield Project, while the children were also treated to an educational workshop on how best to sow seeds.